Osgood Schlatter Disease (OSD) is the most common cause of knee pain in adolescents. It is caused by tension and inflammation just below the kneecap where the patella tendon attaches which can result in a painful bony lump. Osgood Schlatters usually occurs in active people, most commonly aged 9-16, often following a growth spurt and affects approximately one in five adolescents. It is most common in boys, particularly those playing lots of sport involving running, kicking and jumping. Recovery can take anything from a few weeks to a few months and rest from aggravating activities is vital. Here, we will look at what causes it, the classic symptoms, treatment options and the recovery process, as well as prevention strategies to stop Osgood Schlatters developing or returning. The quadriceps muscles (quads) attach to the front of the shin bone just below the knee via the patella tendon. Osgood Schlatter disease usually develops after a sudden growth spurt when the leg bones (femur and tibia) grow quicker than the quads. As a result, the muscles get very tight. This muscle tightness creates a lot of tension where the patella tendon attaches to the shin bone at the tibial tuberosity. This tension pulls on the underlying bone, damaging it, known as Traction Apophysitis, which results in inflammation and swelling, Osgood Schlatter Disease. The body tries to heal itself by laying down new layers of bone, but if you are doing lots of activities like running and kicking, this healing mechanism goes into overdrive causing a bony lump to form on the shin. Sometimes, the tension in the muscles pulls so hard on the bone that small cracks develop, pulling the tibial tuberosity away from the tibia itself. This is known as an avulsion fracture. 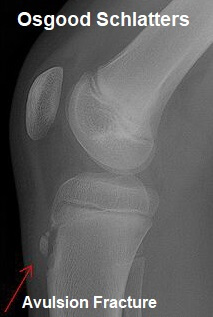 Occasionally, the condition develops following a direct blow to the tibial tuberosity, such as a forceful kick, but this is much less common. The main symptom of Osgood Schlatters Disease is pain just below the kneecap. The area is tender to touch and will hurt with any sporting activity. The pain comes and goes, increasing with activity and decreasing with rest, rather than being constant. You may also be able to feel a bump on the front of the shin bone just below the knee, where the body has laid down extra bone to try and prevent further damage. This can vary in size depending on how advanced the condition is. Usually OSD tends to only affect one knee, though in 20-30% of cases people get symptoms in both knees. To make an accurate diagnosis, your doctor will start by asking you about your symptoms, your lifestyle, what sports you do and how often. With children and adolescents, they will also ask about recent growth spurts. They will then examine the knee, looking for signs of tenderness, swelling, redness and the tell tale bony lump. You may be sent for x-rays to look more closely at the bone affected, particularly if they suspect an avulsion fracture at the tibial tuberosity, but this is not always necessary. This stands for Protect, Rest, Ice, Compress, Elevate and is the first line of treatment. Rest from any aggravating activities until your symptoms have settled and once you return to sport, ice on the knee before and after can also help. It is important to use ice effectively else it can make things worse - in the Ice treatment section you can find out how to use ice safely and effectively and the best ways to apply ice. These are a must! Wearing a knee strap directly on the patellar tendon (below the kneecap but above the tibial tuberosity) works really well to reduce pain and facilitate returning to sport as it directs the tension away from the bone. They are simple to use, extremely effective and only cost around $6/£9. In the knee strap section you can find out more about how they work and which ones are best for Osgood Schlatters. Paracetamol may be recommended to help to reduce the pain. NSAIDS (non-steroidal anti-inflammatories) such as ibuprofen can help to reduce pain and inflammation but are not always recommended for children. Always check with your doctor before taking any medicines. Exercises are a vital part of the rehab process. After an initial period of rest to let things settle down, you can start some gentle exercises. These are a great way reduce the forces going through the knee when kneeling and eliminate friction on the bone. Anyone who spends any time kneeling e.g. gardening, housework, DIY etc should invest in these. Visit the gel knee pads section to compare brands and read user reviews to find the best ones for you. Very occasionally, when the symptoms are severe, your doctor may recommend immobilising the knee in a plaster cast to ensure complete rest for 3 weeks. 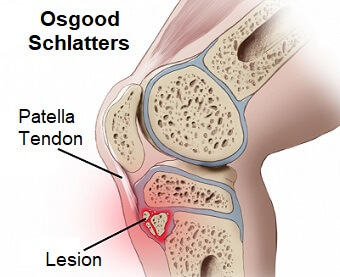 It generally takes somewhere between a few weeks and a few months for Osgood Schlatter Disease to settle down completely. Usually, the knee needs total rest from any aggravating activity for about a week. Then training can recommence but with reduced frequency, duration and intensity, to ensure that symptoms don't return. If they do, activity levels should be reduced again. 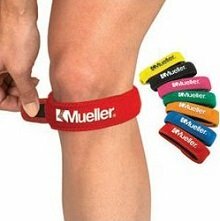 People usually return to normal sporting activities after about a month, but may benefit from wearing a knee strap. However, sometimes it can take a long time to fully recover, up to 2 years. Things usually settle down when the bone reaches maturity at around 16 years of age with approximately 9 out of 10 cases resolving completely. Occasionally however, people continue to get problems as adults. Osgood Schlatter Disease can be difficult to resolve and therefore it is definitely worth trying to prevent it. 1) Knee Stretching Exercises: OSD is caused by muscle length not keeping up with bone growth during growth spurts. 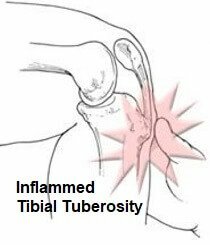 Stretching the thigh muscles will combat this and reduce the tension on the tibial tuberosity. Visit the link to find out the quickest, most effective ways to stretch the knee muscles. 2) Strengthening Exercises: ensuring there is no muscle weakness around the knee can help to reduce the chance of developing Osgood Schlatters. Visit the link for simple exercises that will help. Visit the Osgood Schlatter Exercises section for exercises that will help you recover quickly from the condition. There are a number of other causes of front knee pain. If this doesn’t sound quite like your problem, visit the Knee Pain Diagnosis section for help working out what is causing your pain.